Update February 6th, 2012: The album has been rescheduled for an April release. Check out this post on the Facebook page of “Notes From The Edge” for more details. 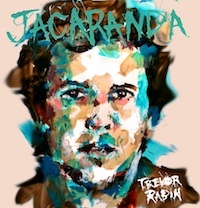 Trevor told us that his new album of instrumentals titled “Jacaranda” is scheduled to be released in early January, and features Tal Wilkenfeld, Vinnie Colaiuta, Lou Molina, and Ryan Rabin (Trevor’s son). The post on Facebook contains a link to the cover of the new album which can also be viewed in a smaller size in this post. What really excites me is the rhythm section of the new album. Vinnie Colaiuta and Tal Wilkenfeld are both amazing players. I am especially a big fan of Tal, which may not surprise you since I love playing the bass guitar. Her playing style and great tone remind me of Jaco Pastorius. After the break you’ll find two YouTube movies of Tal Wilkenfeld showing of her bass chops and her great tone. Trevor Rabin, you’ve struck lucky. I first saw Tal and Vinnie play with Jeff Beck. They are an amazing duo. The “engine room” of the band. I just love watching them play. 30 years ago, Wolf..that was a great album so I expect this new one to be too. Can’t wait to see what Trevor has been working on these days. I sooooooo loved “I Can’t Look Away” and his contributions to 90125 and Big Generator and Talk…..but that WAS some time ago…and he can really do ANYTHING…so who knows what it will sound like. I only know I have waited about 20 years for this CD. Please,Trev…dont make us wait another 20 for a solo CD. Life is short. Music makes it bearable, keep it coming,please!